The students in Mrs. Hunt’s fifth-grade classroom are shuffling to their lockers, dropping off books from one subject, and grabbing materials for the next lesson. It’s good practice as they prepare for the transition to middle school. It is St. Patrick’s Day, and the room smells of cabbage. Two slow cookers filled with corned beef, cabbage, and potatoes bubble on a back table. The students will get to sample some of this Irish-American staple, but math comes first. Today’s lesson is fractions. Students head to the whiteboard and show their work and answers to homework problems where they added fractions. Other students are assigned to check the work. While a few students scribble on the board, Chloe Ortega ’19 enters the room. Rather than sit and watch, she moves around the room, checking in with students, whispering to them if they “get it” or have questions. She has been coming to this classroom for months during math. In an hour, she will head down to kindergarten and help with reading. Mrs. Hunt reviews answers for problems on the board and then introduces a new task: subtracting fractions. Ortega heads to a work table, and the teacher sends two students back there to sit. As Mrs. Hunt explains the concept of borrowing from the whole number, it’s clear by the lost expressions that Ortega has some work to do. She uses a whiteboard and begins to translate the concept by breaking it into steps. Once students understand that 3 ½ can be 2 3/2, subtraction is easy. Through the process she encourages, praises, and gives examples of her own struggles with new ideas and how she gets through it. Soon she is giving high fives and coaxing smiles as students are getting answers consistently correct. Lafayette is familiar with struggles middle school students face in math. That form of literacy is but one that the College works to address. Christine Cohen, America Reads and America Counts coordinator, knows that literacy is more than words and numbers. 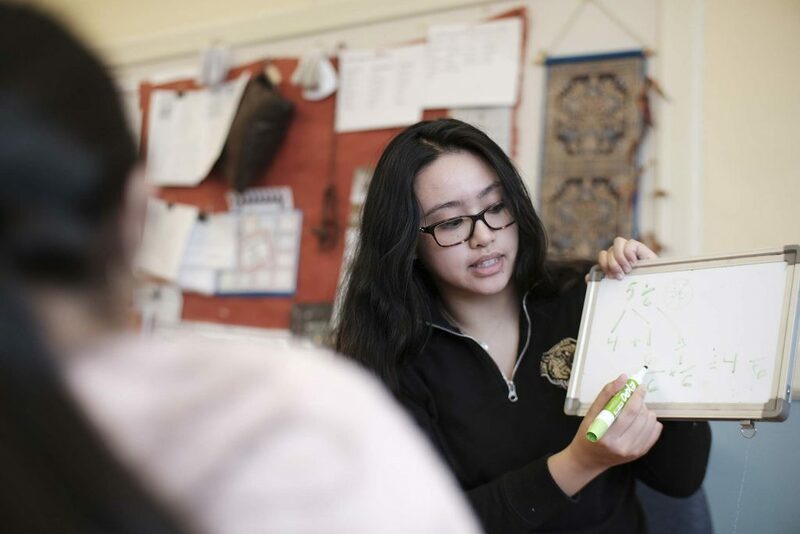 “There are social, emotional, and artistic literacies that our tutors address,” she says. 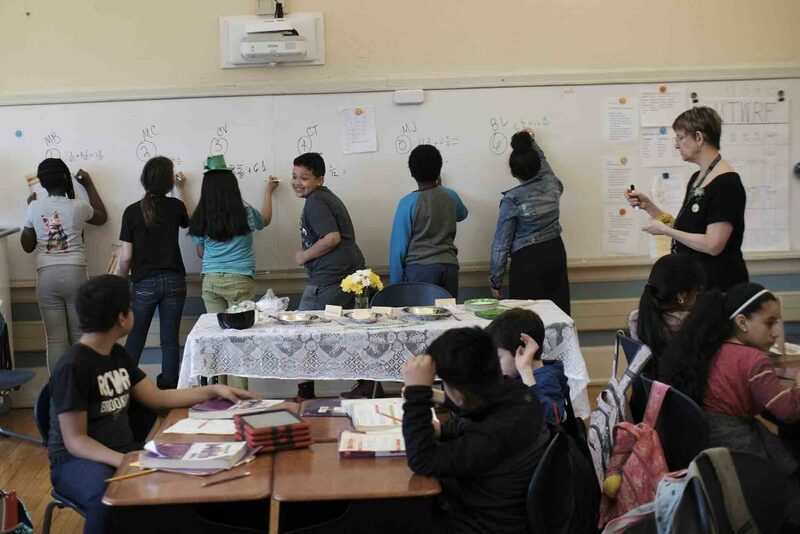 As part of the Landis Center for Community Engagement, Cohen oversees an average of 60 tutors who work at six sites across the city of Easton, including many local elementary schools and after-school programs. The community recognizes that area children need help. 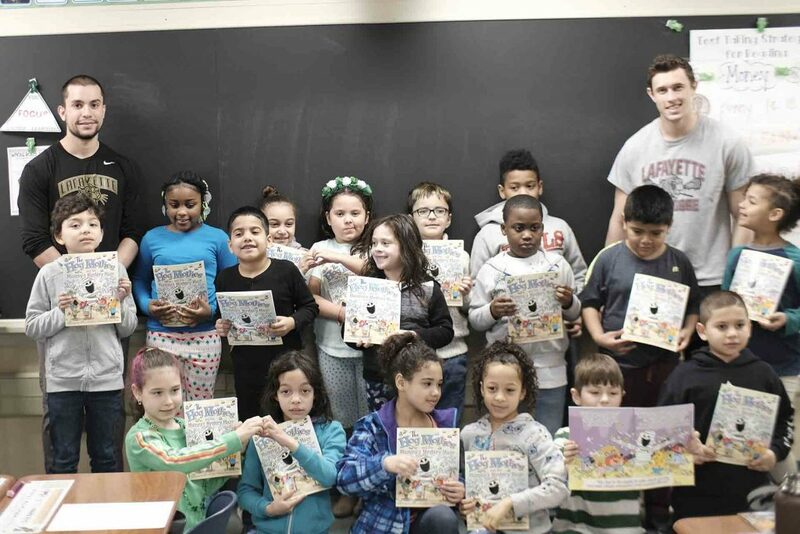 United Way of the Greater Lehigh Valley and PBS39 recently launched an initiative with a single goal: get all Lehigh Valley students reading on grade level by the time they enter third grade. According to United Way, children from low-income homes who don’t read on grade level by the end of third grade are 13 times more likely to drop out of high school. Currently, 35 percent of fourth-graders enter the classroom reading below grade level. While there are various agencies and partners working to meet this goal from across the valley, Lafayette is targeting kids who need extra resources in their own backyard. “The most impressive part of this work is the strong partnerships we have created thanks in large part to the dedicated tutors who learn how to mentor and lead,” says Cohen. The tutors are all paid through Federal Work Study. America Reads tutors choose this position over other opportunities on campus for Federal Work Study positions. Most students are on-site between 4 to 6 hours per week, like Josselyn Alvarenga ’20. The kids in Mrs. Williams’ kindergarten class sit on an alphabet rug listening to a story about Arthur, the 8-year-old aardvark with big glasses. 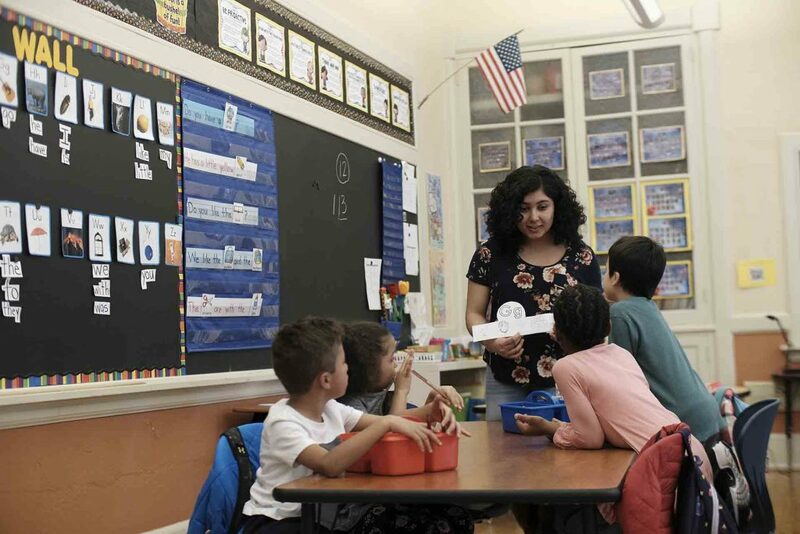 When the story ends, the kids move to various centers where they will work on the letter G.
Alvarenga leads the crown center where students will say words and color pictures that, when stapled, will form a crown that can adorn their heads. She is in her third semester at March Elementary and fourth with the program. Mrs. Williams welcomes that help. While Alvarenga leads a center and other children work independently, Mrs. Williams can have a moment for one-on-one time with students. Adam Finkelstein ’20 has done all of these. He started as a tutor during his first year and as a coordinator at March in his sophomore year. While he loved providing direct service to students, he saw an opportunity for more as he reflected on the work. He remembers a sports after-school program from his childhood with the motto of “letting kids be kids”, and wanted to incorporate that mantra into a fun academic program. This motivated him to create his own model called Leopard Leadership Launch. The principal identified fourth- and fifth-grade students who needed a social boost. 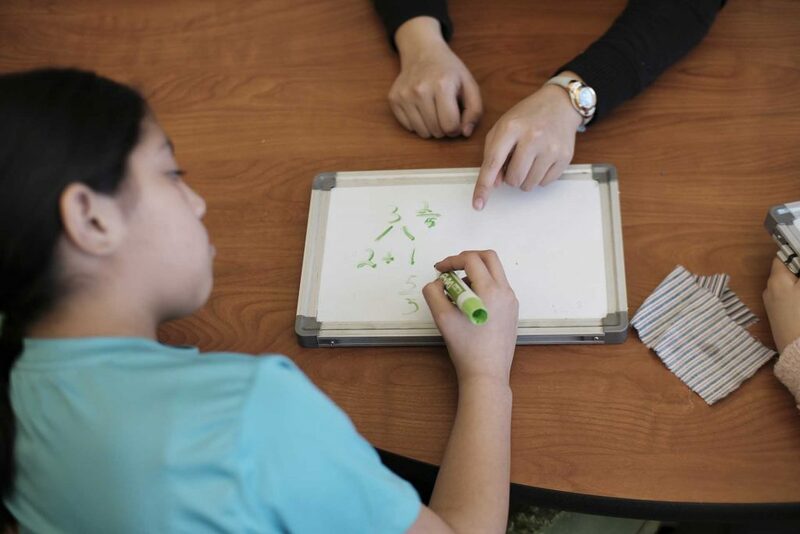 Finkelstein and a group of five tutors developed a curriculum that combined literacy, activities, and the school’s Leader in Me program, which uses Steven Covey’s Seven Habits for Highly Successful People. The team finds books and syncs them with the principles in Leader in Me and creates fun activities. One lesson on teamwork had the kids trying to roll a ball across a tarp without it falling into one of several holes. Impact comes in all shapes and sizes. The door buzzer rings in the principal’s office and in walk six tall young men in Lafayette lacrosse gear. Gonzalez is psyched to see them and bravely confesses that prior to being principal in Easton he was a, cough, Lehigh fan. “You guys have swayed me,” he says. The players nod their approval. Together they grab a box of books and head down to the second-grade classrooms. The team, as part of its community goals, has launched a new program sponsored by the 2nd & 7 Foundation. 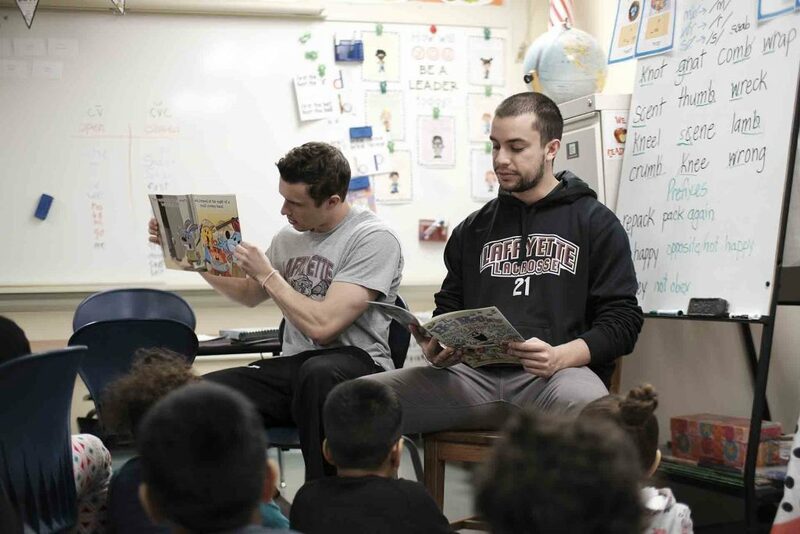 Players visit second grade with a gift of time and books. Today’s book is about manners. With two to three players in each classroom, they sit and read the book to students and then pass out a copy to each child and answer questions from the back of the book. But the magic is in the interactions as the players navigate the room, read questions, show how to eliminate wrong answers, give personal examples of good manners, and reminisce about their favorite books. Scott Bieda, assistant coach for men’s lacrosse, has seen the players really dive in. “The kids have fun and the players practice their skills as leaders, talking in front of a class,” he says. Such a simple phrase in literacy, but such a profound ripple in the lives of many.